Last week I wrote about Google’s new Add-Ons for Docs and Sheets and demonstrated how to find, install and use Texthelp’s Highlighting Tools in Google Docs. This week I am sharing a few tips I wrote for using the Highlighting Tools Add-On in the classroom. While these tips were written specifically for using the Add-On within a Google Doc, they are just as relevant for students using Read&Write Gold, Read&Write for Google™, or even regular old highlighters and a notebook. The great thing about Highlighting Tools is that they can be used with almost any content area or grade level. Below are five strategies that can be used in a variety of settings. Note that some may be more appropriate than others depending on grade level. One of the more complicated tasks that students come across as they grow older and content becomes more complex is being able to separate main ideas from supporting details. Google makes it simple to share one document with your classroom. 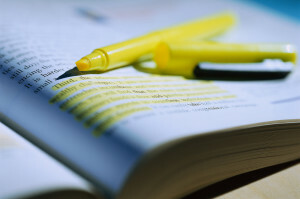 Once students are up to speed on what main ideas and supporting details are (as well as how to use Highlighting Tools), they can enter the shared document and begin highlighting what they believe are main ideas in one colour, and supporting details in another (Note: if the same document is shared with multiple students, you may need to instruct them to make a copy so that they do not see each other’s highlights). These highlights can then be extracted into a new document using the “Collect Highlights” feature. Students can then share this new document with their teacher where notes, comments, and other forms of feedback can be provided. While the previous example can be used as a great instructional tool, many students just need an efficient way to collect notes on the most important parts of a document. Highlighting Tools make this super simple. Students can scan through a document highlighting important information in the colour they choose, then collect those highlights in another document. These highlights can then be quickly accessed any time to assist with studying. In many subjects, it is common for textbooks to list vocabulary words that go along with the unit. While this can be useful, some students may not know any of the vocabulary words, in addition to many other words, listed in the text. Our Highlighting Tools can help by providing a way for students to highlight any words they are not familiar with and insert them into another document. This document can then be shared with their educator, or used with other Google tools to find definitions, conduct research, and more. Highlighting Tools can also be used as a way to assess a student’s ability to identify parts of a sentence. For example, a Google Document consisting of several sentences can be shared with a student. The student can then go in and highlight the subject of the sentence in one colour, the verb in another, and the predicate in a third colour. The highlights can then be collected and sorted by location instead of colour and shared back with the educator for review. There are many different sounds in the English language. While some sounds come from specific letters (short “a” vs. long “a” for example), others come from multiple letters combined. Teaching students these sounds at an early age is very important to the reading process. Highlighting Tools can be used to select all words containing a special sound. Because there are multiple colours, students can use one colour, say yellow, for one sound, and blue, yellow, or pink for another. These words can then be collected by colour for review. Hopefully both teachers and students will find these tips useful. Please share additional strategies in the comments section below!